*** We received the following product as a sample, in exchange for our honest opinion. All photos contained below are copyright Momma Told Me Blog 2013. Momma Told Me: You're supposed to be silent, why are you yelling??? Isn't it ironic how LOUD a game of Charades can get? There are some games, as children, we watch adults play with fascination. No, I'm not talking about Strip Poker, though it's not my place to judge your childhood. I'm referring to Charades. Most children seek to emulate the actions of the adults they look up to, but there are certain entertainment activities young children simply do not hold the patience, or skills to participate in. Sabrina (10) is fascinated by the concept of charades; ironically, since she had great difficulty keeping her mouth shut for 2 seconds, let alone 30. 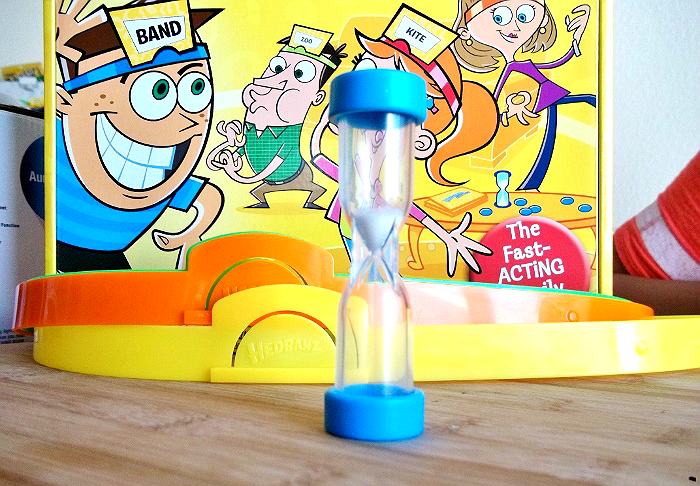 When Spin Master toys sent us one of their hottest games for the Fall I was a little skeptical. Hedbanz Act Up! is marketed for 2 or more players, age 8 and up, but I was unsure how the age differences (adult vs. kid), and the lack of a loud group, would impact the game. The premise is simple. There are 3 categories of cards (person, place, thing) with singular words written on them. 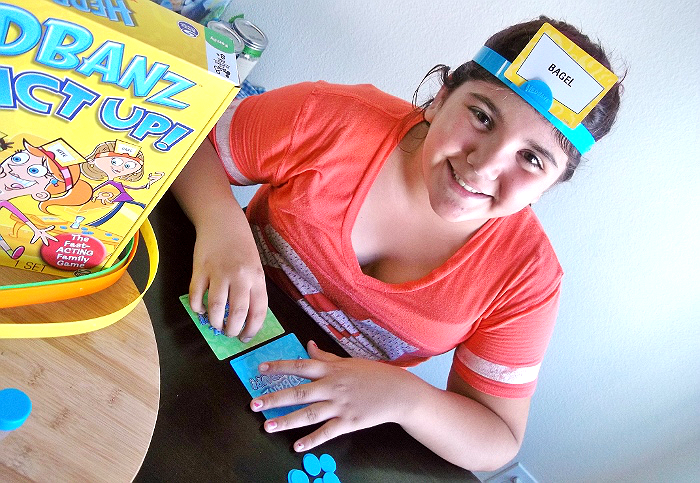 Players attach a snap on plastic Hedbanz to their head and clip a drawn card, word side out, to the center of their forehead. A multi-color die is then thrown to determine which color player will be acting out the card on the current player's head. In the case of a 3 player game, each player gets 2 assigned colors. If the player whose turn it is to guess roles their own color the remaining two players both attempt to act out the card at the same time. When a successful guess is made, the player gets to toss 1 of 12 blue tokens in the center of the table. When all 12 of a player's tokens are gone, they are crowned the winner. 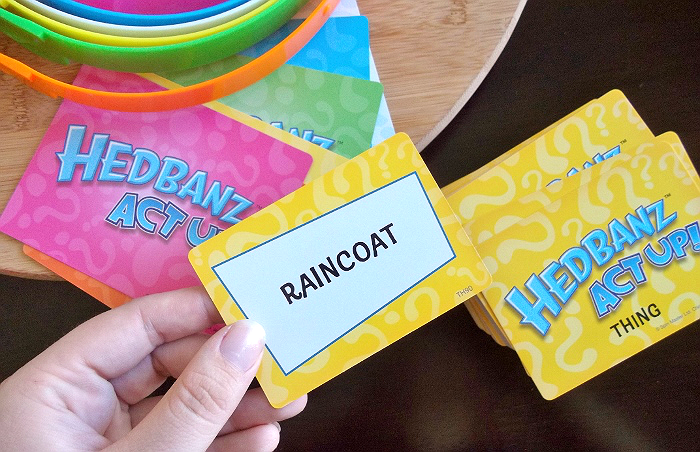 It's a modern improvement upon classic charades, with the Hedbanz adding a touch of silly that will excite kids. In all, we truly had a blast. After our first game, there were demands for a second game. By the end of the second game, Jay was offering to take some of his blue chips back, just to keep the game alive. I had been worried about the cards being too complex for 10 year-old Sabrina to act out, or even know what the words were. Boy did she, and the game, prove me wrong. The chosen words are very common items, places, and people, nearly anyone off the street would know. And, if anything, acting out common words like 'plumber,' 'cloud,' and 'Superman,' only aided in grander actions and hilarious skits. We did seem to find the 30 second timer went a bit fast for us though- and will probably swap it out with a 45 or 60 second one from another game box. While 30 seconds was plenty for the adults, we had to give Sabrina basic hints to help guide her mind down the right path. Simply telling her that her card was a 'thing' left a very broad category to guess in 30 seconds. Instead, for the younger players, we decided to offer a category hint with each of her cards. This seemed to help even out the competition. When playing in bigger groups the person acting, and the person guessing each get to toss a token if the guessee is correct. Since we only had 3 people, we skipped this rule for our first few games. 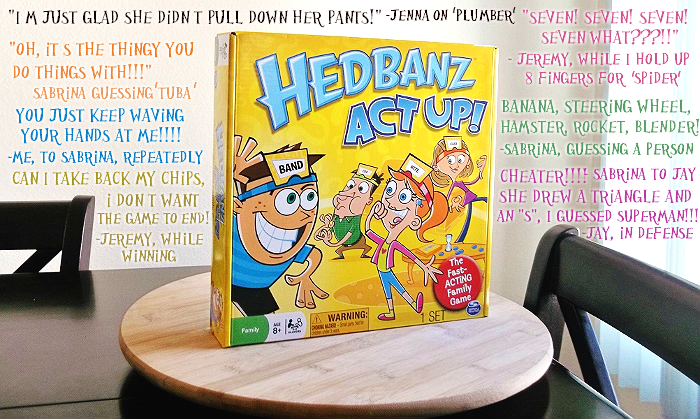 I wish I could replay some of the actions done, by all parties, during our several games of Hedbanz Act Up! Particularly, Jay's impression of a 'gymnast,' pretending to air cartwheel, while remaining on both feet- or my personal impression of a 'lobster.' The fun really starts when more than one person is trying to act out a card. Since players are not allowed to use any pointing (to items), or sound, while acting out a card, the magic truly happens when two actors begin working together to build shapes and interactions. I made a big circle with my hands, and Jay made a smaller one, inside, for 'bagel.' Sabrina motioned for rain, while I tried to cover myself for 'umbrella,' etc. I'll just say, I never had an aspiration to be a method actor until I had to convey 'bull rider' or 'Harry Potter.' In all, this game is great for players of all ages, and groups big and small. 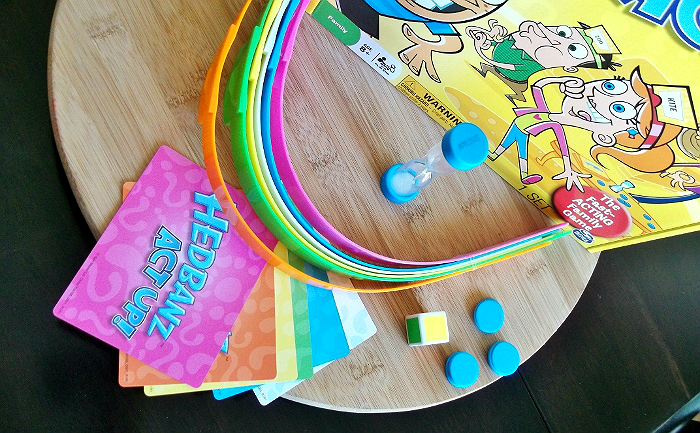 Why not take your Wordless Wednesday to the next level with a family game night and Hedbanz?- Hedbanz Act Up! is currently sold at fine retailers such as Toys R' Us, Target, Walmart, and online at Amazon. 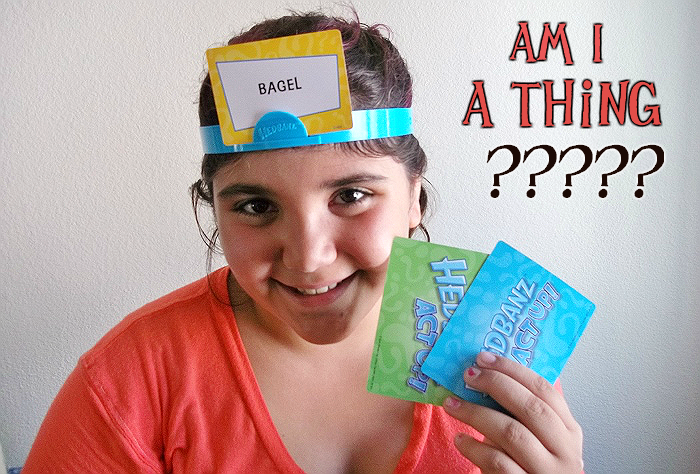 What Daughter Says: A great game brings it's players to life- that's exactly what Hedbanz Act Up! does. this looks like a super fun game!! Looks like a cute game. I bet my son would enjoy it. Looks like a fun family game. We'll have to get this for game night. This seems like such a fun game! My kids would love it! We played something similar to this at a job I once had during orientation. It was so much fun! OH this would be such a fun game to play with the kids. Or for them to play with their friends! I love it! I have an app that has a game like this. It brings much laughter as I am sure this Hedbanz did. Sounds Loud! My daughter has played that with friends at their house before - it looks like such a fun game. I've always loved charade games. They do get loud though!